It sat on my bathroom counter for years, “it” being a large cork with a styrofoam hemisphere glued on top and seashells covering the styrofoam. I’d had it for years. Way back when Peter and I were dating or engaged – I honestly can’t remember which Christmas it was – his brother and his family had given me a glass jar filled with red and green m&m’s and topped with this seashell-covered lid. The majority of the shells were augers, a small spiral shell that is easy to find along the Crystal Coast. Once the m&m’s were history (my love of m&m’s is legendary among my friends and family members and was a running gag in grad school), that jar made a lovely addition to my bathroom counter, often filled with cotton balls. A few years ago, my younger daughter accidentally knocked the jar off the counter, leaving me with just the lid. I’m pretty sure my husband’s sister-in-law had painstakingly glued all those shells onto the lid herself, had designed it from shells gathered over the course of numerous trips to the family’s beach house. Because of that, I couldn’t bring myself just to trash it, and as I was striving towards decluttering the counter top, I really didn’t feel replacing the jar was a high priority. 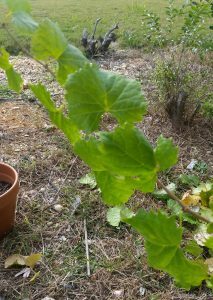 One morning over breakfast as I was staring out the window at the grapevine trellis edging its way to winter’s dormancy, it came to me. 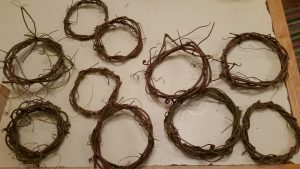 I could make grapevine wreaths! I wouldn’t even have to buy them; I could harvest my own grapevines and make them myself. A little later that morning, the shell-covered lid caught my eye, and the idea of making beach-themed wreaths for Christmas gelled. All the grapevine wreaths Peter and I made. I have no idea what I’m going to do with the rest of these! I made a video of the designing of these, complete with a view of the final results. I hung these right beside the front door, and I am pleased with how they turned out and how they look. Although it looks like they’re strung together, I left them separate so I could hang them differently in other years. I’m also excited to be able to showcase the beautiful shells that were originally on the jar lid and give them new life. Happy crafting, and please post your project pictures! I’d love to see them!